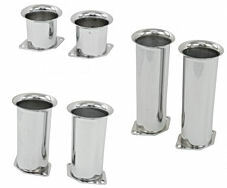 Select Choose Height Pair of 2.25" Pair of 4" Pair of 6"
Chrome Stacks (Air Horns) for Weber IDF, Empi HPMX and Dellorto DRLA Carbs. Sold in pairs. 2 1/4", 4" and 6" tall. Click options tab to choose your height.